The Minor Factions DLC is coming next week. We’re definitely due a new Sins of a Solar Empire. Rebellion, the last standalone expansion, came out in 2012 and fans of RTS-4X hybrids have been pretty underserved since. Unfortunately, we’re not getting a sequel, but Rebellion is getting some new DLC very soon. The Minor Factions DLC will pop into existence on December 17. Minor Factions throws 15 new minor factions into the cosmic maelstrom. Prospective stellar conquerors will need to court and control these minor factions, competing with the other major powers. They can be talked into joining empires, bringing with them unique abilities and bonuses. There are mercenaries, xenophobes, pacifists, miners and resistance fighters, each giving their host empire a thematic advantage. The Nilari Cultists indoctrinate people to use in suicidal rampages, which doesn’t sound very nice, while the Viturak Transport Cabal lets empires get access to black market tech. 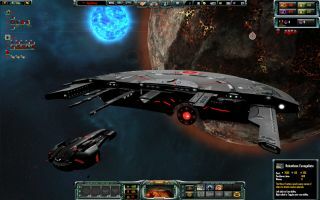 Minor factions are common in 4X games, but the description is especially reminiscent of Endless Legend’s system, where assimilating minor factions and taking advantage of their unique bonuses was an integral part of the game. Rather than just being small empires, they’re resources for the top dogs to fight over. The relationship and advantages are more clear than, say, Civilization’s city-states. You’ll be able to grab Minor Factions on Monday for $6. In the meantime, stare at these lovely screenshots.